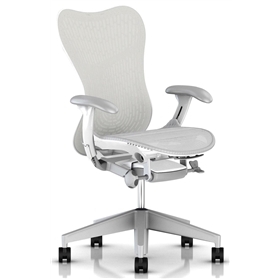 The Herman Miller Mirra 2 is ergonomically designed to make sure it provides the perfect comfort while working. The Mirra 2 chair moves as you do to make sure that it is at one with your body. It adapts to you instantly as soon as you sit down and the backrest is designed to take the curve of your spine into account. Even if you shift slightly it will support your movements and provide the perfect level of comfort. It is also much more affordable than some of the higher end Herman Miller products.